Need word counts when composing entries for blogs or Twitter? Using Ctrl+Shift+G gives you words and character counts with and without spaces. It also gives you paragraphs and lines. Change document view to outline view, making it easier to work with ­master documents, and collapse and expand by heading with Ctrl+Alt+O. 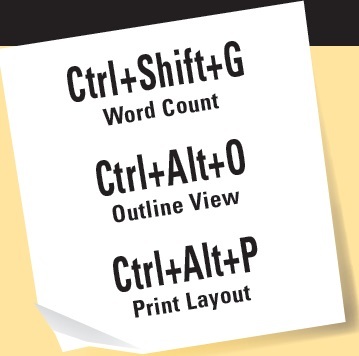 Go back to print layout from any other view by selecting Ctrl+Alt+P.